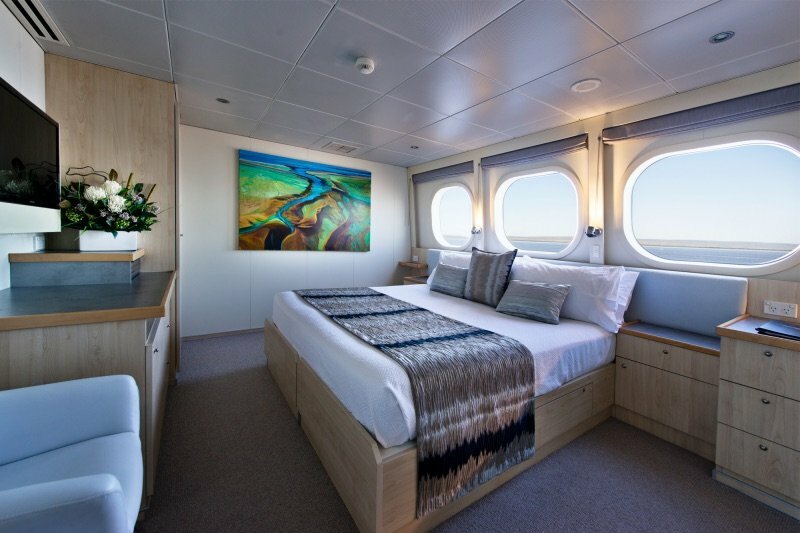 For 28 years the Kimberley Ultimate Wilderness Cruise has been our flagship product, and we are justly proud of the fine blend of adventure, luxury and service we deliver to our guests on this thousand nautical mile voyage from Wyndham to Broome. From 2014 we are featuring a Kimberley cruise with a difference – the Kimberley Waterfalls! Experience the emotive beauty that accompanies the end of the wet season! Experience the Kimberley’s renowned summer storms and spectacular light shows! Experience thundering waterfalls and swollen billabongs. And, not forgetting unexplained rock-art, extraordinary wildlife and monster barramundi! Please Note: Some departures run in reverse, please contact us for more details. • Be ‘personally’ introduced to a Kimberley icon – The Horizontal Falls. • Manoeuvre right under the falls at King Cascades. • Travel to the magnificent Hunter River. The Hunter has it all – fishing, mud-crabbing, bird-watching and simply exploring “where few have been before!”. • Join the ‘hunt for the black-lip oyster’. Savour their unique taste direct from the rock – aside from the freshly squeezed lemon, you can’t get much more a la naturale than that! • See the “Bradshaws” – ancient rock art that pre-dates other examples of Aboriginal culture. Start the day with some hot fishing action – this time at “Three Ways”. Then all aboard to the impressive silhouette of Raft Point. Here, join crew and guest alike for a moderate climb to an art gallery with a difference and, the well-preserved Raft Point Wandjina Paintings. You will probably be enjoying lunch as we weigh anchor and set sail for Montgomery Reef! Montgomery is a unique eco-system that must been seen to be believed – and see it you will – as 140 square miles of coral reef rises out of the ocean right before your very eyes! Water cascades from the reef as the tide falls exposing a privileged glimpse of another world! Turtles, dugong, manta rays and every imaginable sea creature abound and the helicopter puts it all in perspective! Be amongst the first on deck and join an early morning fishing expedition, or see some stunning rock art or join the ship’s naturalist in one of the expedition boats – and all before another breathtaking helicopter flight to a picnic that you’ll never forget! 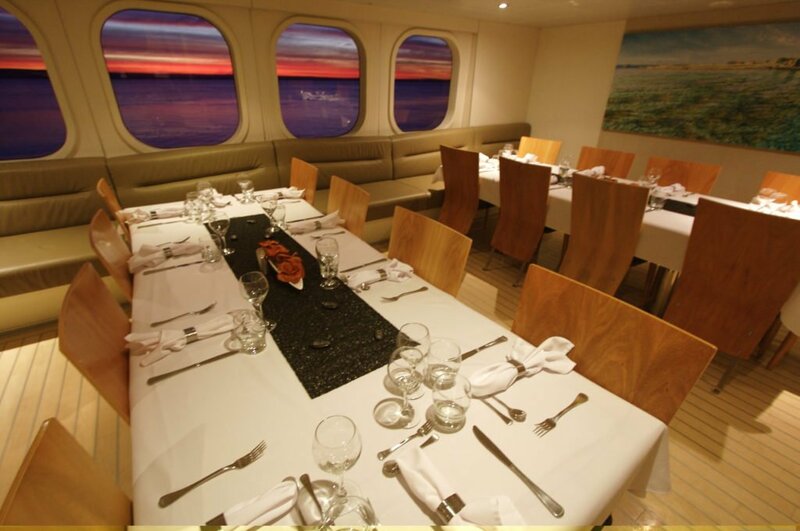 The True North’s mouthwatering cuisine alongside a crystal clear billabong – in one of the most remote places on earth! Wake this morning in the magnificent Hunter River. The Hunter is about as far away as you can get in Australia – a stunning river system that is lined with dense mangrove forests, surrounded by rainforest encrusted mountains and home to man-eating crocodiles. And, the Hunter has it all – fishing, mud-crabbing, bird-watching and simply exploring “where few have been before!” Join one of our expedition boats for a closer look, it’s only a short hike to Jackson Falls, and, there’s even more splendour from the helicopter! In the afternoon we will sail into Prince Frederick Harbour for another chance to catch a plump wet season barra, finishing the day with sunset drinks on your own secluded beach. Today you will have another opportunity to see the “Bradshaws” – ancient rock art that pre-dates other examples of Aboriginal culture. In fact, they are possibly the oldest ‘paintings’ known to man. The heli-picnic at Eagle Falls is always a ‘big hit’ – another breathtaking helicopter flight and, TRUE NORTH’s mouthwatering fare alongside a picture perfect waterfall in remote far-north Western Australia! The tenders will be busy exploring local beaches and rivers and, we also visit an isolated site in the rainforest where a lone bomber crashed during WWII. The TRUE NORTH allows discerning adventurers to experience wilderness in surroundings more akin to one of the world’s most exclusive hotels. 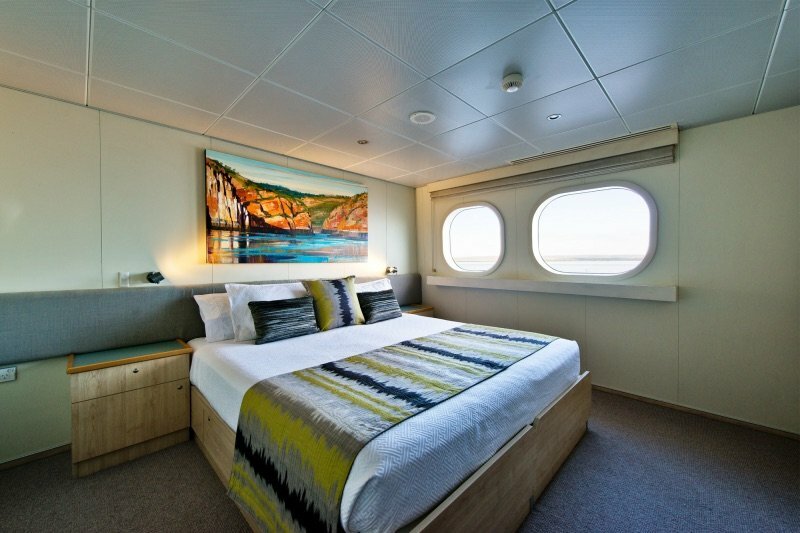 Guests are able to take advantage of a number of lavish vantage points including a sundeck, a forward observation lounge, a ship’s lounge and an alfresco bar. 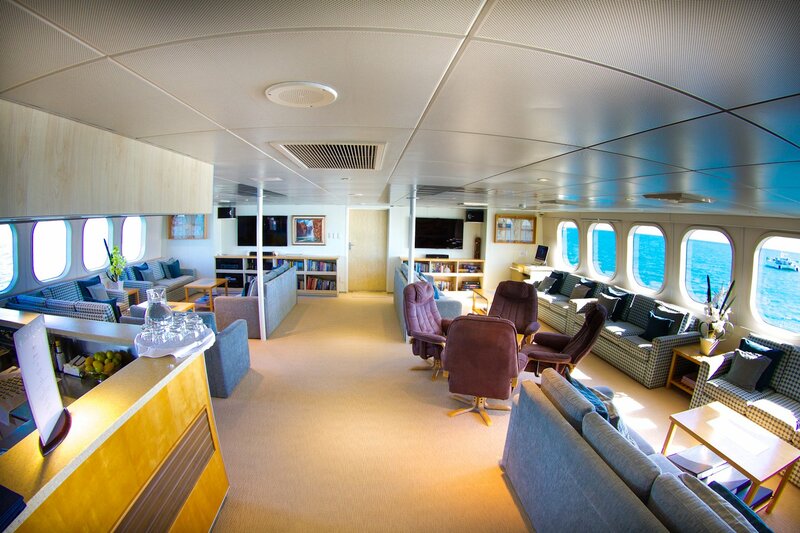 The ship’s naturalist presents interpretative information on plasma screens and, an internet café enables convenient communication with the outside world. Helicopter flights can be purchased additional to the cruise tariff as a package or individually.